Jesuit missionary priests are known to have accompanied the explorer LaVérendrye who explored the North-West beginning in 1731. The first permanent Catholic mission in what is now Manitoba was not established until 1818, however. That year, Reverend Joseph-Norbert Provencher (1787-1853) was sent from Quebec to the Red River Settlement where he built a church at the junction of the Red and Assiniboine Rivers and named it St. Boniface. Provencher became known as "Giant of the West", both because of his great achievements in establishing the Catholic Church in Western Canada and because he was 6-foot-4. In 1820, the Church in the North-West was canonically established when Provencher was named Coadjutor Bishop of Quebec with responsibility for the North-West. He was made Bishop of the North-West in June 1847, serving until his death in 1853. 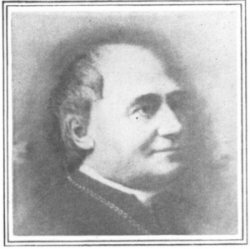 Alexandre-Antonin Taché (1823-1894), a descendent of the explorer LaVérendrye, arrived from Quebec in 1845 and was ordained as an Oblate priest by Provencher a few weeks later. He served as a missionary to the native peoples in the North. At age 27 he was named coadjutor bishop and future successor of Provencher. Following his consecration, and even for some time after Provencher's death, he personally continued missionary work in the North. The diocese's name was changed from North-West to St. Boniface in 1854. It became a Metropolitan Archdiocese in September 1871, with Taché as the first Archbishop. In December 1857, Father Vital Grandin, O.M.I. (1829-1902) became Taché's coadjutor. 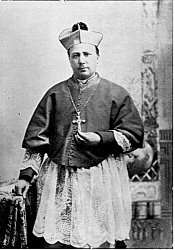 Grandin became bishop of St. Albert in Alberta in 1871. 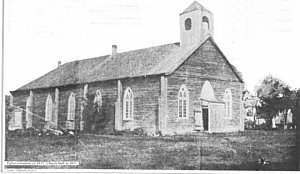 St. Charles Church along the Assiniboine River (now the western edge of Winnipeg) had its beginnings in 1854. St. Mary's, however, was the first church on the original site of Winnipeg. It began in 1869 when Taché rented rooms on Notre Dame Avenue for a school and church. In 1873, a two-story building was erected in downtown Winnipeg on land donated by the Hudson's Bay Company. It was blessed by Taché on May 30, 1874, although the parish of St. Mary's was not canonically erected until 1876. In 1880, construction began on a new St. Mary's church, which later became St. Mary's Cathedral. It was blessed in September 1881 and solemnly consecrated by the Archbishop of Montreal on September 25, 1887. Land was also acquired for St. Mary's Cemetery in the Fort Rouge area of the city. 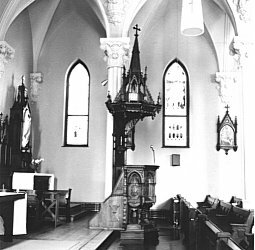 Winnipeg was growing so rapidly that a second parish, Immaculate Conception, was founded in 1882 in the city's North End. Adélard Langevin, O.M.I., Archbishop of St. Boniface from 1895 to 1915, had arrived in July 1893 as Vicar of the Oblates and briefly became pastor of St. Mary's. In 1900, Holy Ghost Church was opened to serve the estimated one thousand Polish Catholics who had settled in North Winnipeg during the last years of the 19th Century. Then in 1904, St. Joseph's German parish was established. These parishes were initially served by two young Polish Oblate priests, brothers Wojciech and John Kulawy, who arrived in Winnipeg after completing studies at the University of Ottawa. 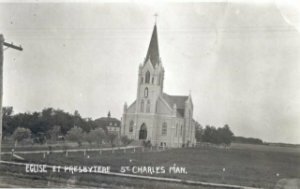 In 1904, the French Canadians attending St. Mary's asked for a French parish. The pastor divided the congregation into French and English groups until Sacré Coeur church, which was dedicated in December 1905, could be built. Several notable institutions connected to what would become the Archdiocese of Winnipeg had their beginnings around the turn of the century. St. Joseph's Orphanage was opened in 1900 by the Grey Nuns and moved into a new building on Portage Avenue in 1907. In 1938, the Sisters of Providence of Kingston took over the orphanage and changed its name to St. Joseph's Vocational School. The Sisters of Mercy (Soeurs de Misericorde) from Montreal were invited by the Archbishop to open a mission for unmarried mothers in 1898. They built a small building to care for obstetrical cases. By 1916, it had evolved into Misericordia Hospital and nursing school. The Sisters of the Holy Names of Jesus and Mary arrived in 1874 to take over the first Winnipeg school, which had been opened by two Grey Nuns in 1869. 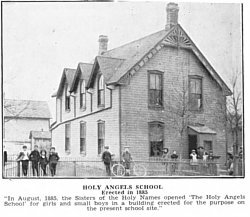 In 1903, the Holy Names Sisters bought 15 acres of land near the Assiniboine River in Fort Rouge and built the present St. Mary's Academy for girls. Between 1926 and 1965, the Academy offered university credit classes towards an Arts degree in addition to elementary and high school classes. The Sisters also taught at St. Mary's School (originally called Holy Angels) across the street from St. Mary's church where classes began in the fall of 1904. In 1912, the pastor and a group of parishioners met to plan for construction of a new St. Mary's church. By late 1913, they had purchased several parcels of downtown land and had taken out a loan for $350,000-actions that were to prove financially catastrophic for St. Mary's. Construction, planned to begin in 1914, was put on hold due to the outbreak of the First World War and the new church was never built. Prior to 1915, thirty-one parishes had been canonically erected in what is now the Archdiocese of Winnipeg. Four parishes predated St. Mary's. They are St.Laurent (1864), St. Charles (1868), Notre Dame in Selkirk (1874), and St. Eustache (1874). Many parishes had their missionary beginnings long before their canonical erection. St. François Xavier, for example, was canonically erected the same year as St. Mary's. It is, however, considered the second oldest parish in Western Canada. (St. Boniface parish is oldest.) St. François had its beginnings in 1824 when Cuthbert Grant led a group of settlers from the Pembina area to White Horse Plains. The settlement became known as St. François Xavier, and the first chapel was built there in 1828. 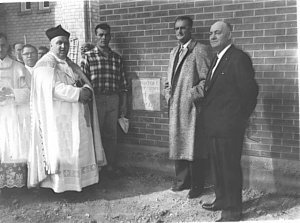 The first known Mass in Brandon, Manitoba's second largest city, was celebrated in 1880. Regular monthly Masses were said in a tent, beginning the following year, until the first St. Augustine of Canterbury church was built in 1882. Redemptorist priests served the parish between 1898 and 1924. St. Viator's parish in Dauphin was founded in 1905, but Oblate missionaries had visited the area since 1880. In 1904, the Clerics of St.Viator arrived in northwestern Manitoba and began serving in Dauphin.